The plant featured on the June 2013 cover of the Obispoensis was chosen because of a request. It is the California, coast, island, or wild morning glory (Calystegia macrostegia). The common name, false bindweed, is sometimes used instead of morning glory. Bind weed and morning glory are often used interchangeably. This species was chosen because of a request by CNPS member Yolanda Waddell who asked some time ago about the plant. Bonnie and I encourage anyone to email, write, or even call us with comments or questions about the drawings or articles or both. After doing this since the mid 1970’s, we especially like to receive suggestions for native plants that others might find interesting. Plants called morning glories generally produce large flowers with five fused petals arranged in the shape of funnel. Bindweeds generally have smaller flowers. The morning glory common name refers to the fact that individual flowers tend to open in the morning and close by the same afternoon. Most of the time the flowers are basically white, but they may have pale pink veins. As the flowers age, they may take on a pinkish tinge. There are at least two possible explanations for color changes in flowers. First is that it is caused merely by the aging and dying of the petal’s cells and has no survival value. However, there is a second possible explanation. It has been documented that some flower color change is controlled by the flower in order to signal its pollinator that this flower has been visited already so don’t waste your time visiting me. Why would a plant do this? If pollinators visit only unpollinated flowers, then the pollinators will visit more flowers because they will visit only those flowers still requiring a pollinating visit. Is the color change in morning glory ecologically significant? I don’t actually know, but it would be interesting to find out. Let’s look at Bonnie’s drawing. It shows a single twining stem. Note how thin the stem is drawn; it’s less than oneeighth inch in diameter. From each leaf bud a stalked 1-3 inch flower or pair of flowers arises. This means they are widely spaced along the individual stem. But, in the field, morning glory stems are rarely found single. A given rootstock produces many stems that will start out growing side by side, and because they twine they wrap around each other forming a structure similar to a braided rope. Since each individual stem is producing flowers, a given length of “rope” produces many flowers that appear to be growing side by side. Leaves in this morning glory are extremely variable in size. On new stems leaves may be only an inch or so long but at other times they can grow to be nearly six inches long. Leaves are triangular with two prominent lobes at the base. Calystegia macrostegia is an extremely variable species. The most recent Jepson Manual recognizes six subspecies throughout its range which runs mostly along the coast from just north of the Bay Area to just south of the Mexican border. There are also subspecies on the Channel Islands. Therefore this morning glory is almost an endemic Californian, i.e., restricted to the state. The subspecies to be expected in our area would be C. m. ssp. cyclostegia. Since this subspecies is found almost exclusively on the mainland, I think the best common name for it would be California morning glory or even better California coastal morning glory. There are three genera that typically bear the morning glory common name. They are Calystegia, Convolvulus, and Ipomoea. Ipomoea is native to the old world and is the genus of garden morning glories. 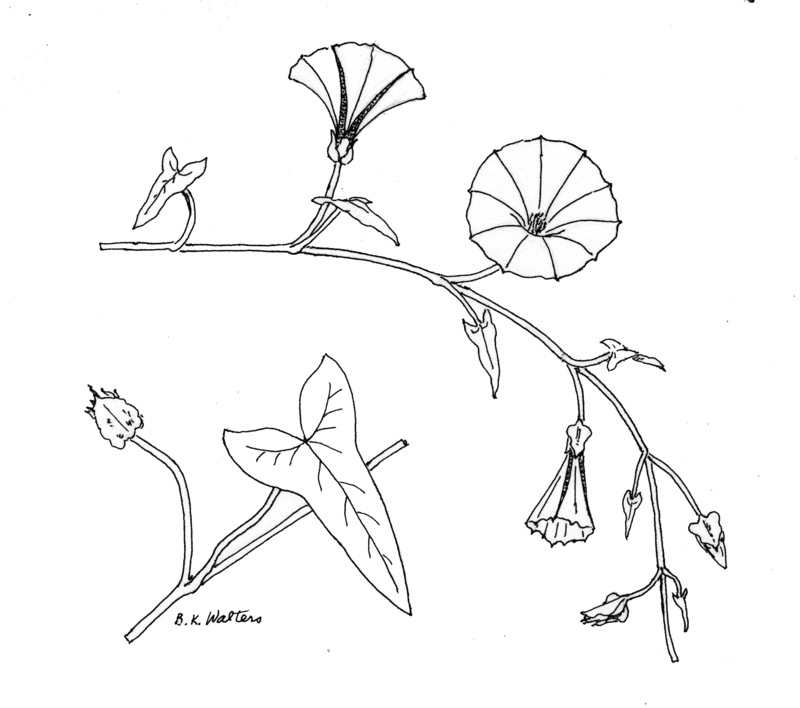 In older plant ID books, species now separated into Calystegia and Convolvulus were all included the genus Convolvulus. Currently these two genera are separated most easily on the size and location of two bracts that are attached to the flower stalk. In Calystegia, the bracts are large and totally hide the calyx. [Caly = calyx or sepals and stegia = Greek meaning to hide]. Macrostegia refers to the fact that the hiding bracts are large (macro). In Convolvulus, the tiny scale-like bracts arise from near the middle of the flower stalk.